I mentioned in an earlier post that we missed out on seeing the Dom in Salzburg on the Saturday because we had no tickets for the concert. So before leaving Salzberg, we were determined to at least see that one special place. We ventured forth very early over the river to the “Dom Quarter” by trolley bus. It’s so easy with a Salzburg Card. Our main bus stop was outside the Mirabell Schloss, just two blocks from our hotel. All we had to do, was check the map of the bus and trolley bus routes, find the bus route that would take us close to the old town, hop on and go. My feet were so relieved. Not so much footpath pounding. We had explored all that area by foot, now it was time to take the bus! The bus dropped us close to the old town where we walked throught the narrow streets, empty early in the morning, to the Dom Square. And there, we found to our delight that the church was open. Even more to our delight it was EMPTY. One couple came in for a couple of minutes and then left. After that we had that whole magnificent building to ourselves for half an hour except for a member of staff putting out fresh candles for the day. In the photo above, David, centre aisle, seems dwarfed by the immensity of this magnificent building. Above him is the dome, in front the altar, and surrounding him on the walls are four of the five sets of pipes for the organ. 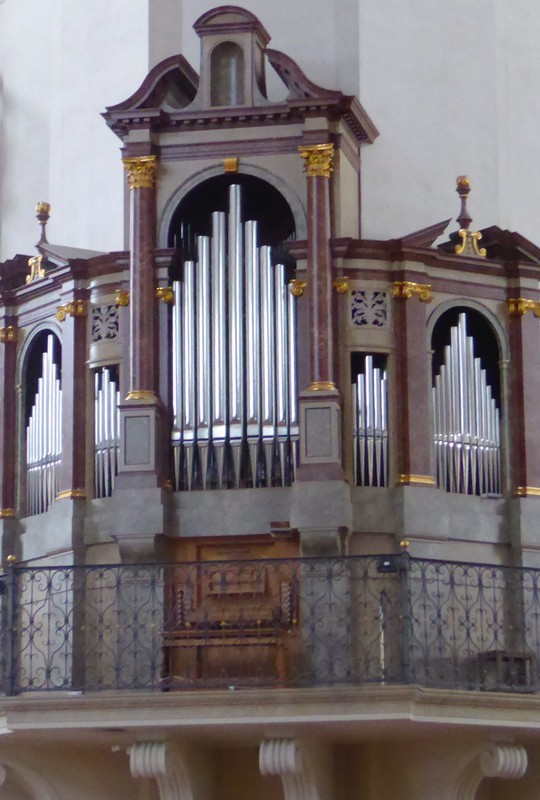 To hear this organ will be top of the list for going back to Salzburg again, outside of the tourist season. It’s just one of the things that will take us back. 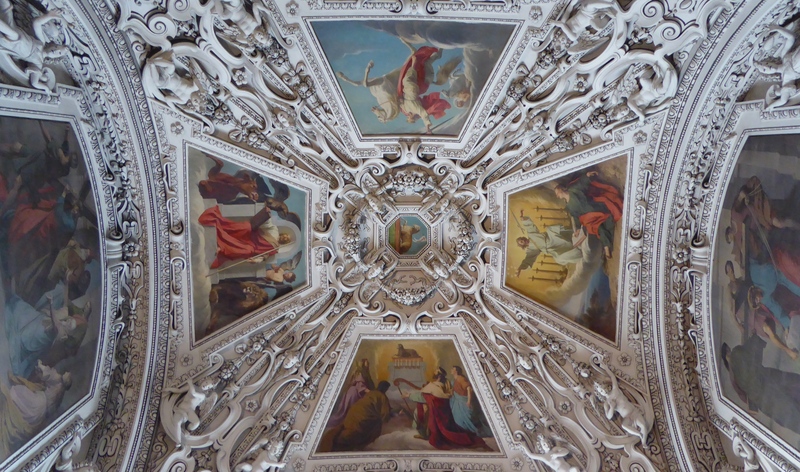 So we may have missed the concert, and we may not have heard the music of the five organs in this place where Mozart played and wrote much of his religious based music, but we had an experience not shared by many. 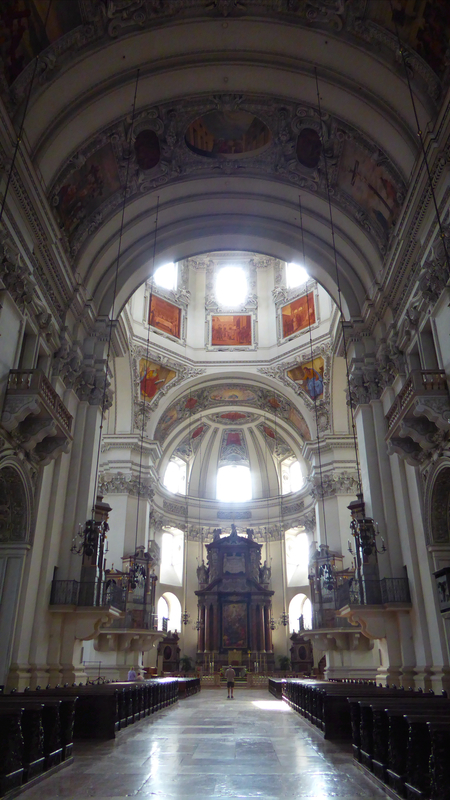 We sat in total silence and peace in one of the most beautiful baroque buildings in the world. We were mesmerised by the wonderful art works and sculptures, the space and light, the whole feeling of “being” in a place created with love and skill by so many artisans. How lucky were we to have to time and quiet to take it all in! There are several photos in the Dom of the damage done to the dome by a bomb in World War II. It took many skilled hands to restore it, and the rest of the church, to the state it is in today. As I looked up into the perfection of that rebuilt dome, it gave me pause for reflection and remembrance for those whose lives are being torn asunder still today by war and strife. One could not help reflecting in that place of perfect peace, on the need for peace in this world of ours. Of course the stillness and beauty of the moment was all too soon broken by the first group of chattering, clattering people as the Dom returned to its status as Salzburg’s main tourist attraction. 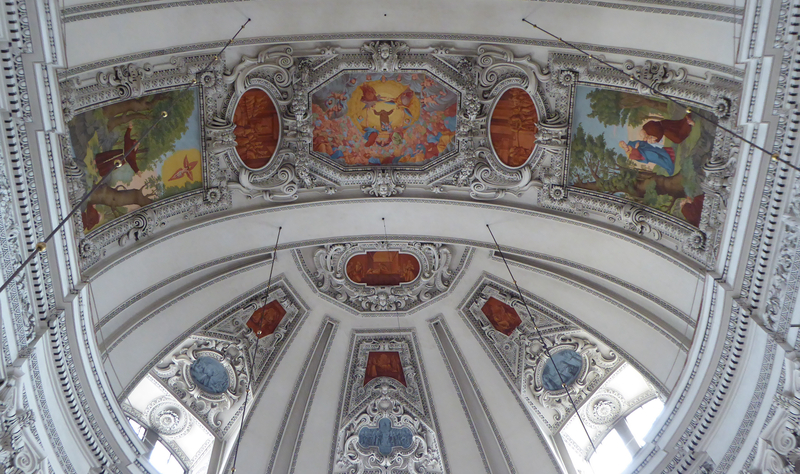 We were so grateful for our very special experience in this church which is really the embodiment of Salzburg’s long history as an ecclesiastical principality. 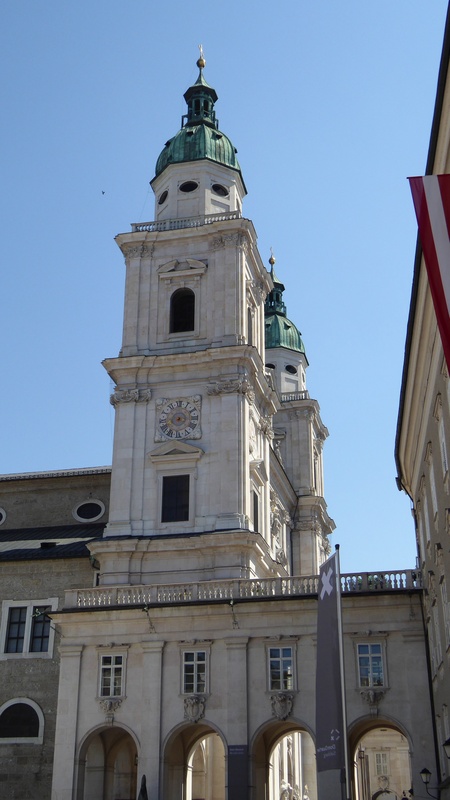 The story of this church showcases in one building, the power and independence of Salzburg’s succession of Prince-Archbishops. 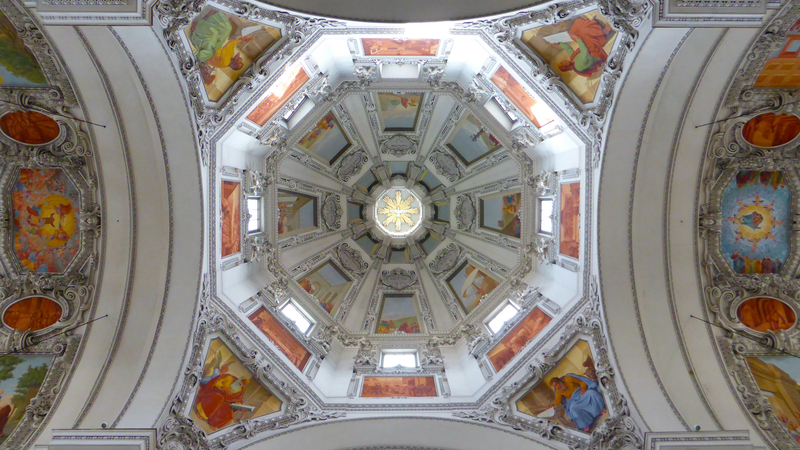 The very first cathedral on this site was built by Bishop Virgil who came to Salzburg in 767. 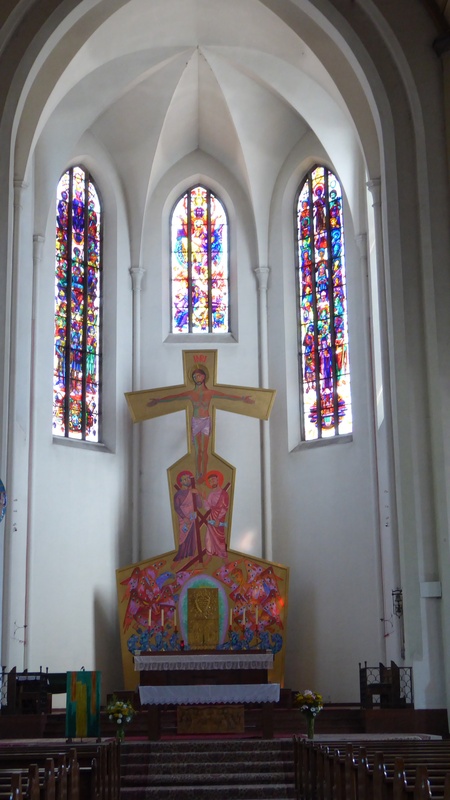 It was consecrated to St Virgil and St Rupert in 774. 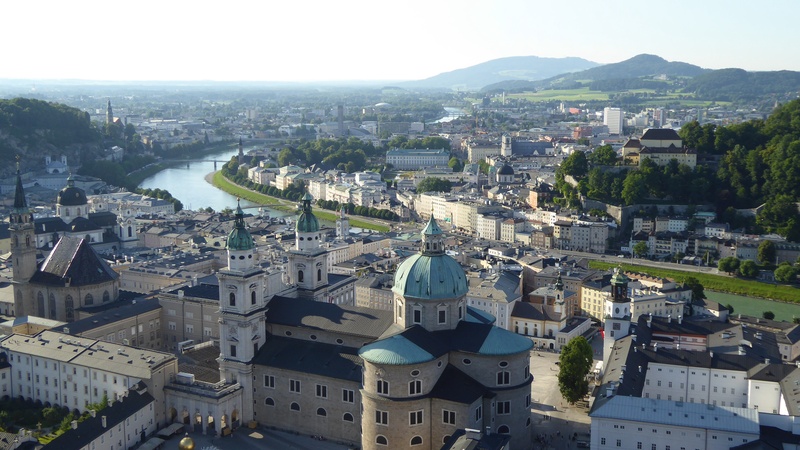 That cathedral stood until 1167 when the “Counts of the Plain” destroyed Salzburg with fire. Ten years later, in the time of Archbishop Conrad III, the Cathedral was rebuilt in Romanesque style; it was described as beautiful, magnificent, impressive. That Cathedral stood until 1598 when another fire raged through the building. Now this was in the time of the reign of Prince-Arshbishop Wolf Dietrich, the one who built Mirabell Schloss. He had great plans for a complete rebuild of the Cathedral. He commanded that the damaged building be torn down. In doing that, valuable sculptures and gravestones of previous archbishops were destroyed, and even more ruthless, he had the cemetery plowed up and the bones of the dead just thrown on the debris pile. 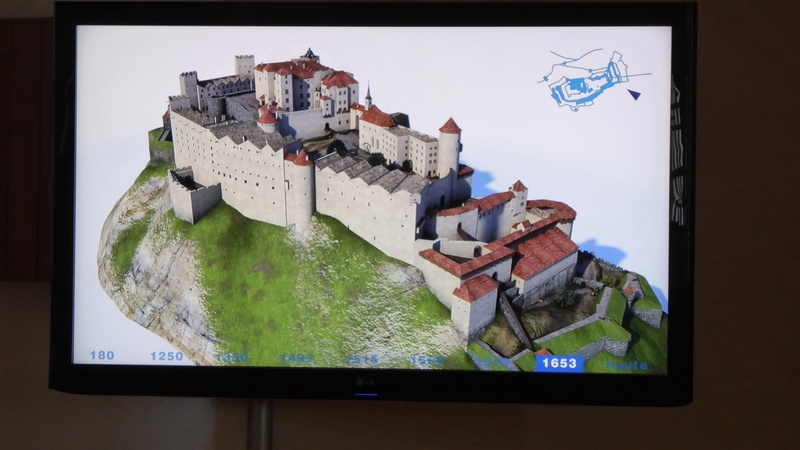 As can be imagined, the citizens of Salzburg were not greatly impressed by this! They were, in fact, outraged. But, nonetheless, the foundation stone for the new cathedral was laid in 1610. 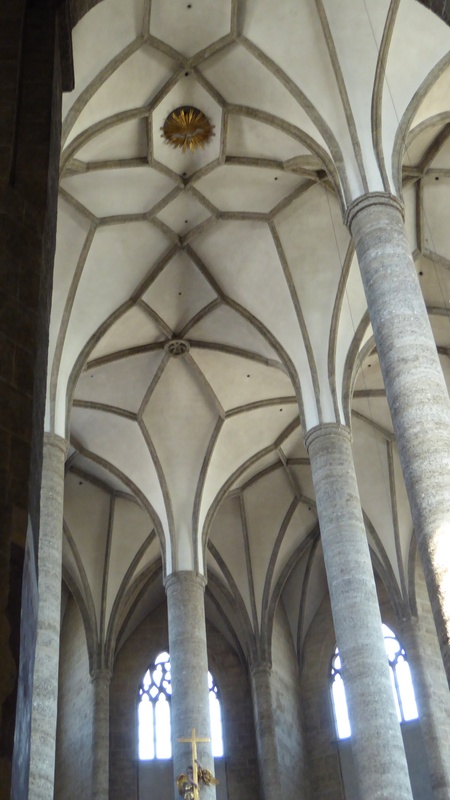 But 1611 was a turning point in the fortunes of Wolf Dietrich… and of the Cathedral. After bitter disputes over the salt trade, Wolf Dietrich ordered military occupation of one the major salt mines at Berchtesgaten. 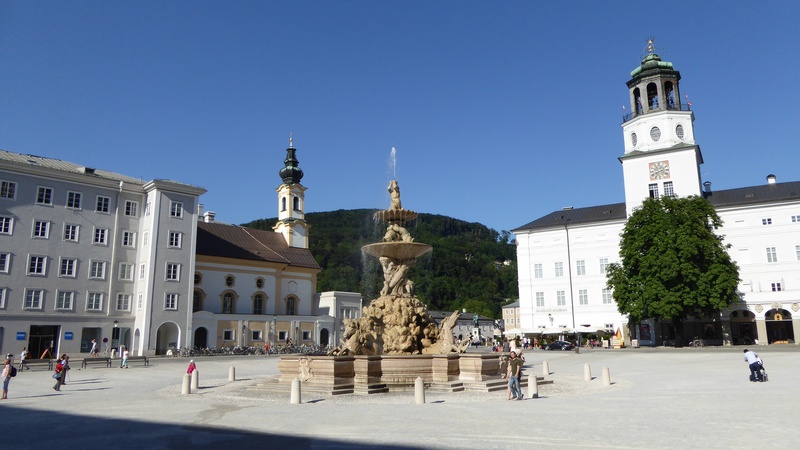 In response, Bavarian troops stormed the archbishopric in Salzburg. 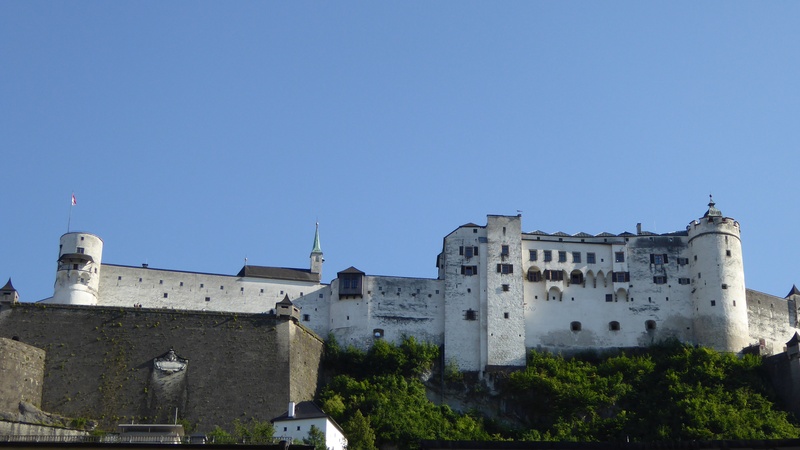 Wolf Dietrich tried to flee but was captured and imprisoned in the Fort above the city, Hohensalzburg. 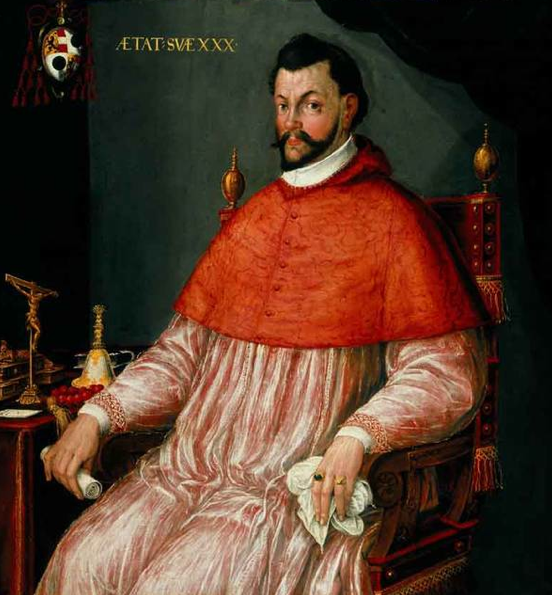 Wolf Dietrich’s nephew Markus Sittikus took over as Prince-Archbishop. He kept Wolf Dietrich as a prisoner in the Fort and had Wolf Dietrich’s mistress, Salome Alt and their children banished from the city. 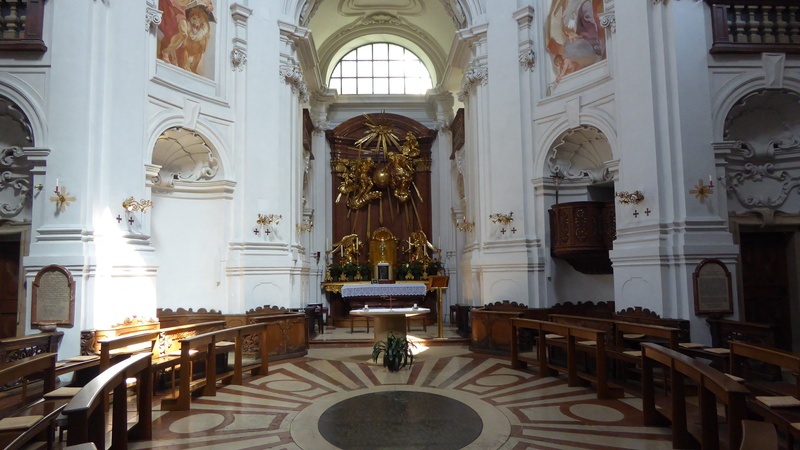 It was Markus Sittikus who commissioned Santino Solari to build the new cathedral, the first Baroque church north of the Alps. Ther are many more stories about the history of Salzburg in the Salzburg Museum on the Dom Square. 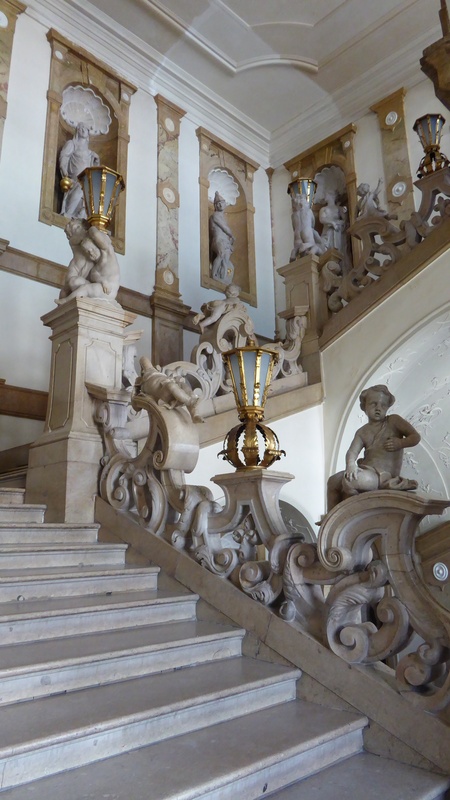 That’s a must visit for next time, as is a visit to the Royal Residence, also in the Dom Square and only recently restored and opened. Before leaving, we took many photos to share on our flickr site, but the ones above, will give some idea of why the Dom is so special. It is stunning! As more and more people began to arrive at the Dom, we left to wander down to the small streets and enjoy a quiet breakfast in a quiet square. Now that’s when Salzburg is at its best. We hope to go back one day to enjoy so much more of this fine city and of its surrounding countryside, villages, mountains and extensive lakes areas. Having enjoyed so much of the art and sculptures of the baroque period, it was interesting to pass by a contemporary art gallery on the lower side of the Dom Square. 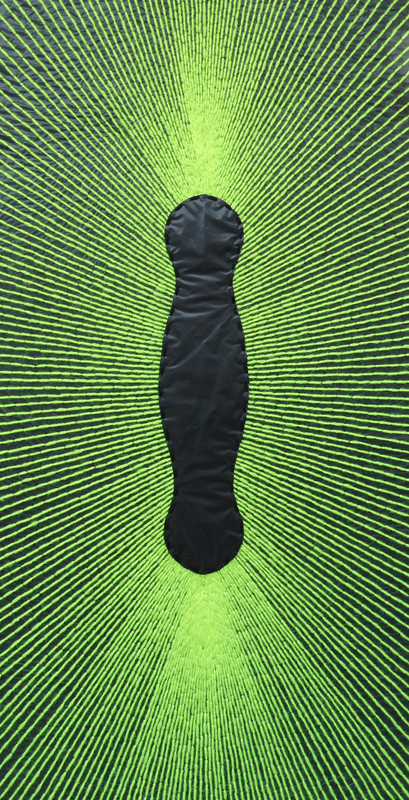 One of the larger pieces, above, was striking, yet simple in its construction using plain running stitches in green wool on black silk. All too soon it was time to head back to our hotel to collect our bags, climb on board another bus to the main rail station for our train to Innsbruck. We need not have hurried as it turned out. Our 11am train did not get away from the station before a strike of rail and station workers, called to start at 11am, began. As other trains arrived at the many platforms of this station, they too stayed still. It was an odd feeling to be sitting in a train at a station full of trains going nowhere. The stop work meeting concluded at 12 noon and we were soon on our way to Innsbruck. More of that city anon. As the heat continued to envelop Salzburg, we did the only sensible thing and headed for the mountains that surround the city. It was quite easy really. Just outside the Mirabell Schloss, we caught the local #25 bus and headed, with other like minded escapees, to the countryside. Most got off at either the zoo or Hellbrunn Palace but we continued further on to the end of that bus route, to the very base of the Untersberg mountain. After a quick breakfast, we joined a short queue for the cable car which would take us up that mountain and away from the heat of the valley. What a good idea! Up to the mountain top! 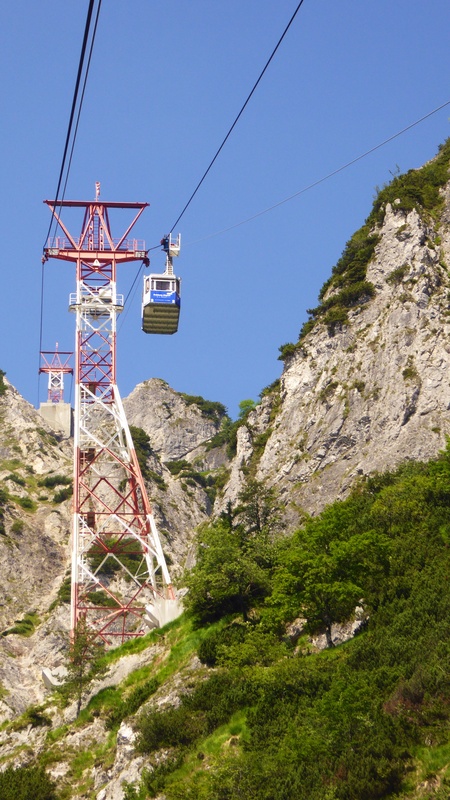 The bottom station is at 456 m, and the top station is at 1776 m, so we rose a total of 1320 m in that cable car. The first section is a really long free hanging span of 1,548 m between the station and the first pylon. Two cable cars run as shuttle traffic, one going up as the other comes down. Each car can take up to 50 people so I was very lucky to be able to stand at a front window and photogragh the views during our ascent. This is perhaps not for those queasy of heights or of hanging in mid air, but it is, for me, always a very special experience to be able to go up into such mountain areas. Looking out over the heat hazed valley below. At the top, we found ourselves not only hundreds of metres above the valley floor and the heat hazed city, but ten degrees cooler. And there were added advantages: wonderful scenery and a chance to hunt for wildflowers. Although we were above the tree line, except for a few low growing alpine conifers, there were lots of tiny alpine flowers to discover. I have added photos of both scenery and flowers to my flickr site, web link at the end of this post. One of nature’s natural rock gardens. The paths at the top are not easy walking, as one might imagine. But for those who can manage them, and who feel so inclined, there are walks further upwards and onwards for mountain hikers, but we do not fit into that category. 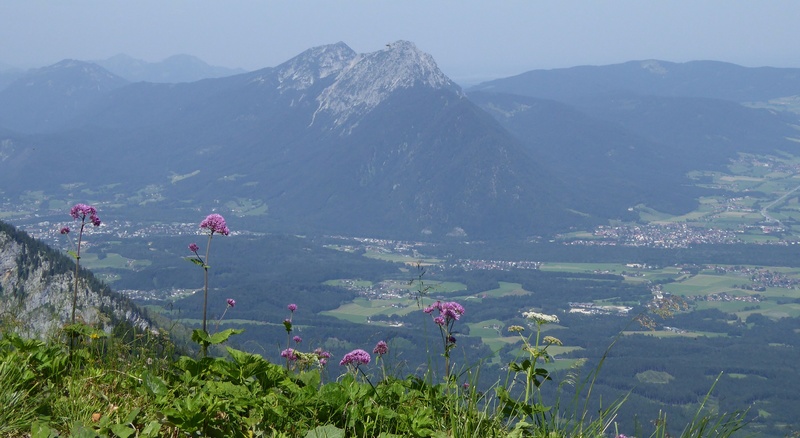 Some scrambled up to the mountain climbers memorial (at Geiereck, 1805 m) while others began the hike to Salzburg Hochthron Mountain, (1856 m). A few others began the crazy, in my opinion, task of walking down the mountain on what appeared to be little more than goat tracks. We, on the other hand, found a seat on the outdoor area of the small Hochalm cafe from where we could enjoy the view in relative cool. 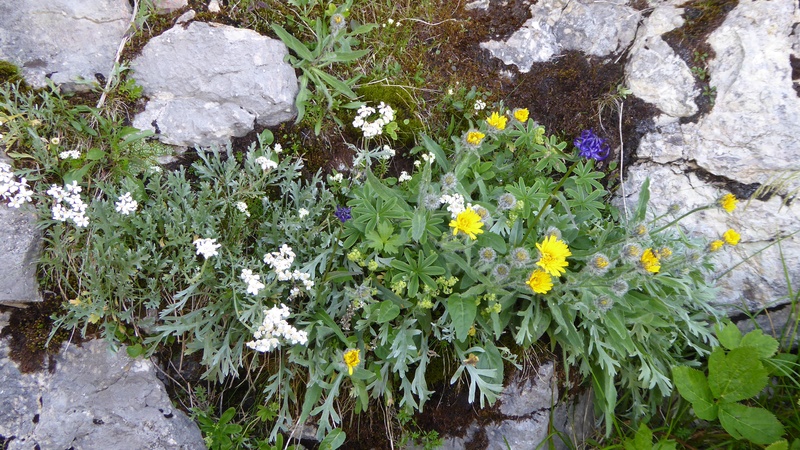 And right beside our seat was a delightful natural alpine plant rock “garden”. Perfect! And for David on a hot day, nothing better than a large cold beer. While the Salzburg valley sweltering in the heat far below us, we enjoyed a cool respite, and cool drinks. 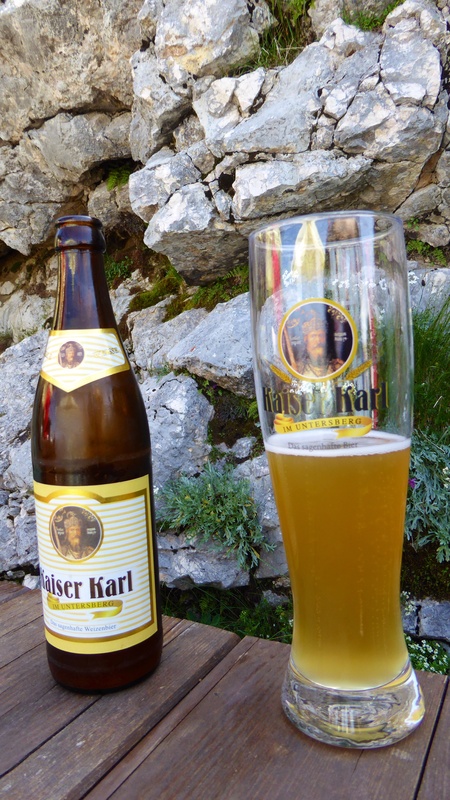 David enjoyed his Kaiser Karl beer which came in a glass to match the brew. This we found to be a common practice in many of the places we visited. Each area seemed to have its own local, or at least national beers, and in several places there were many boutique beers as well. I, on the other hand, enjoyed the cool, fresh taste of pure tap water from the Austrian alps. We stayed at the top until after a delicious lunch in the mountain air, and then caught the cable car back down to the small village where the #25 bus awaited us. The palace of Hellbrunn was to be our next stop. 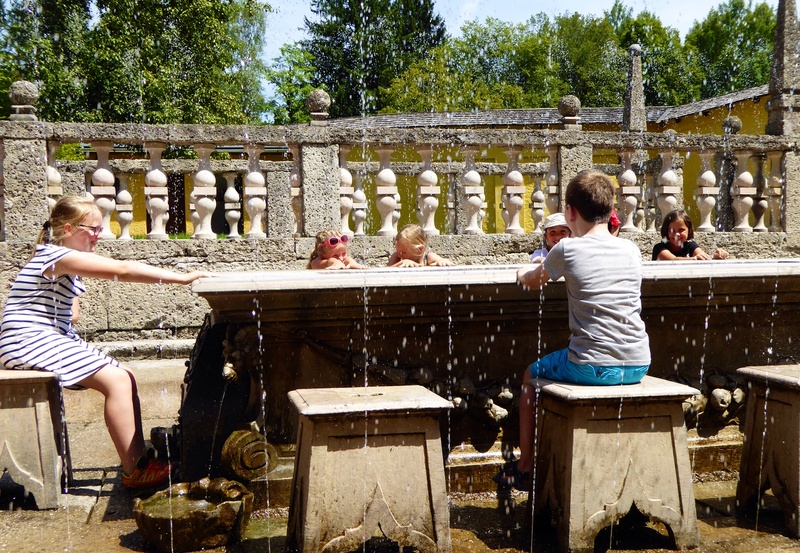 One of the many water features at Hellbrunn Schloss. 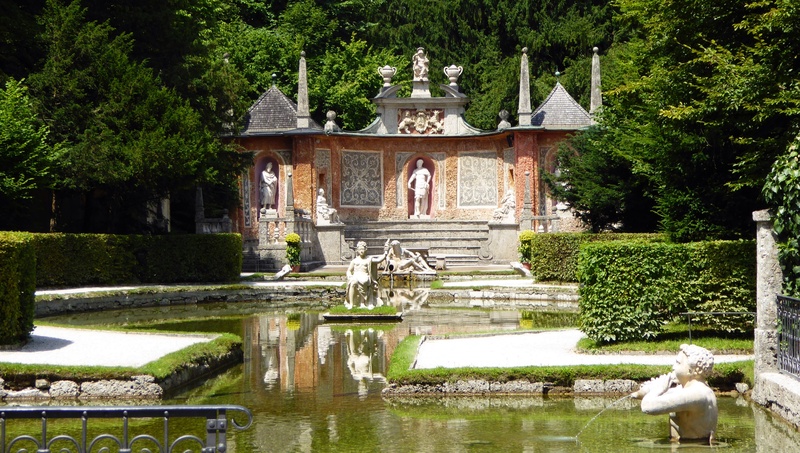 Hellbrunn Palace with its many pools and water features was built in the early 1600s by Saltzburg’s Prince Archbishop Markus Sittikus, the one who renamed Mirabell Schloss. 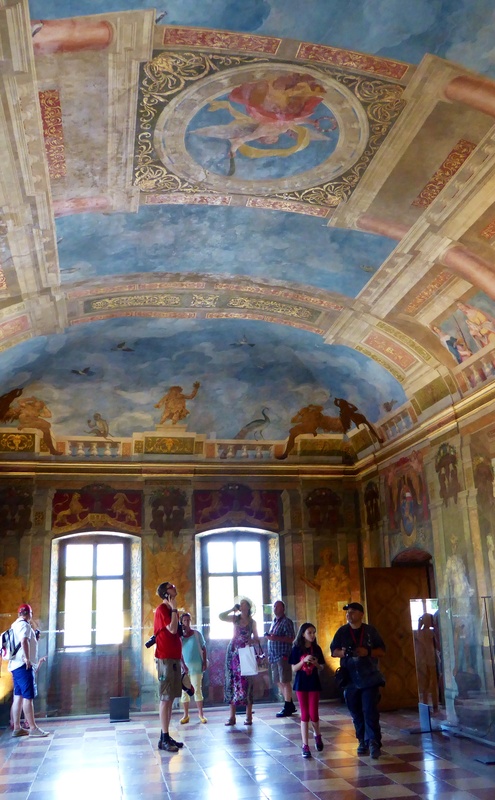 It was built as a “Lustschloss”, a pleasure palace, and that is how it was used during the hot summers of his reign. 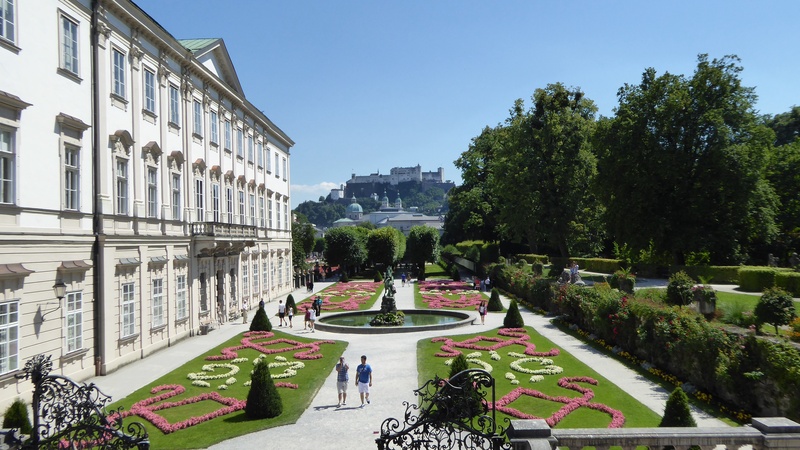 This Salzburg ruler made sure that he was surrounded by invited aristocracy and beautiful women at his summer residence. And, for the hot summer months, he made use of the plentiful supply of water from the mountain to add the cooling effects of water into the design of his extensive parklands. Wet bottoms for all – except the Prince Archbishop! As temporal as well as religious leader of the community, Markus Sittikus was extremely wealthy… and he also had a rather unusual sense of fun. The many water features in his Wasserspiele, all look wonderful, but they also have trick features. For it was not just a sense of fun that was on display in these gardens. There was also often an element of Markus Sittikus showing his guests just who was “top dog”. At the flick of a switch he could have his guests made extremely wet! At a table used for summer feasts, the archbishop could flick a switch under his seat to make jets of water come up through the stone chairs of his guests, making them extremely wet, while he stayed dry. In one of the grottos, a crown, representing him, rose on a jet of water while those watching were sprayed with water which came from many unsuspected places. At another place, there’s an incredible scene of the opera Don Giovani, with a hundred or so cast all moving to the music, all powered by water. Watching, fascinated, it’s easy to forget that somewhere, sometime, fine jets of water will undoubtedly rain upon you. And so they do! Many of the grottos, the coolest places, have highly decorated ceilings… But beware, at the whim of the archbishop, or in our case, of a uni student enjoying the “best summer holiday job ever”, those in the grotto find them selves cooled by fine mists of water. It soon became obvious that the best way to elude a drenching, was to find the floor least wet to stand on. But that didn’t always work. I was caught by a special directional spray when our young friend realised that I was completely dry! No-one escaped. But who cared. A cooling spray of water on a hot day was most welcome. The children in our group had a wonderful time and soon became completely drenched. Mothers had come with towels and a change of clothes and everyone had a great time. More photos on my flickr site. 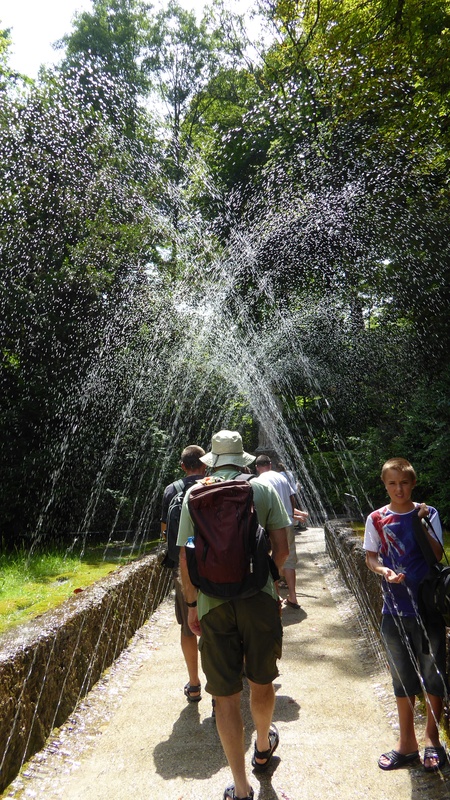 Just before we left the water garden, we had to walk through a guard of water jets, just for luck. It was all a lot of fun and a great way to stay cool. A walk through the palace park soon had us dry and seeking refuge in another cool spot, the palace itself, which held some interesting displays of life in the Archbishop’s time. To help visiors enjoy the palace, and learn about the important features of each room and the whimsies of the archbishop, headphones are available in several languages. These came as part of the entry ticket, not an added extra! I’ve added photos on my flickr site (see link below). We did the whole day, bus, cable car, Palace entry, all on our Salzburg card, so really had good value for the money spent on the card. And we had seen some of the countryside and had been so much cooler than in the city. As we left the palace, a storm was looming. We made it back to the hotel before, thankfully, the storm brought some cooler temperatures and fresher air to the city. While the storm spent itself we rested and then, in a much cooler evening, we went out to go the concert at St Andräs church. We must have misread the venue; we were the only ones there! However there was someone playing the organ and trying out the various stops, so we were able to sit and enjoy that. I still don’t know where the concert was to be! So, no concert, but instead a delightful cool evening walk in the Mirrabell Gardens. This time, not nearly as many people and a chance to enjoy the walk. And when we got back to our room, there was a concert of Beethoven’s 7th on the TV… and that was most enjoyable too.